The Bosgård facility lies on a peninsula in the middle of the Lake Åsnen. The whole area is an Eldorado for anglers, nature lovers and people simply looking for peace and quiet where each season has its own charm. At 15 000 ha or some 37 000 acres the lake is one of the largest fishing areas in southern Sweden and offers 740 km of shoreline. There are uncounted numbers of islands and coves offering indescribable variation. Every season has its own charm, and all our houses are modern and fully equipped for self catering and all have wireless internet access. At Bosgård by lake Åsnen we speak Swedish, English and German with our guests. 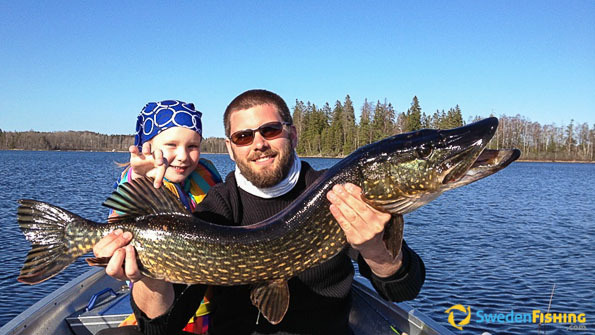 Spring fishing begins in April-May (pike), summer ranges from June through August (pike, pikeperch, perch) and autumn fishing for the same fishes stretches from September into October. In addition to boats, we rent out canoes and bicycles. There are many sites worth seeing in the area, as well as activities such as moose safari, porcelain museum, windmill, and farm stores. Closer to nature are lovely hiking trails where you can pick mushrooms and berries. We are the sixth generation at the Bosgård estate and we do our best at all time to make our guests feel at home! In our Lake Åsnen fishing waters the primary target is pike, pikeperch and perch. The trophy fish among our guests is a pike at 17 kg and 118 cm. We have around 15 aluminium and plastic 4.4 m boats for hire. All are fitted with 4-stroke motors and electric motors. Only 8 km to the south of our facility you can find restaurants, a bakery and shops, as well as sales of fishing equipment. We also sell fishing licences for lake Åsnen. 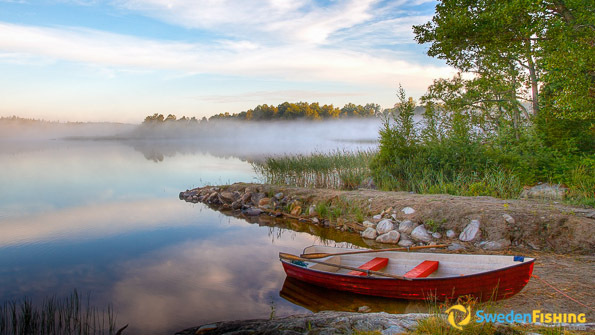 Lake Åsnen is one of the largest fishing waters in southern Sweden. Some 15 000 ha or 37 acres in size with a shoreline measuring 740 km, There are uncounted numbers of islands and coves offering indescribable variation. Its greatest depth is 14 m. its average 3 m. Here you can catch such fish as pike, perch, pikeperch and eel. The usual fishing methods are spin-fishing, trolling and coarse fishing. Lake Åsnen empties into the Mörrumså River. The Åsnen FVOF fishing conservation sets the rules. Min/max sizes: Pikeperch - 45 - 70 cm; eel – 70 cm; pike – 50-80 cm; and trout – 40 cm. Max 2 fishes (pikeperch, pike) per fishing licence and day. Max 2 rods/licence. Pikeperch may not be taken in May. 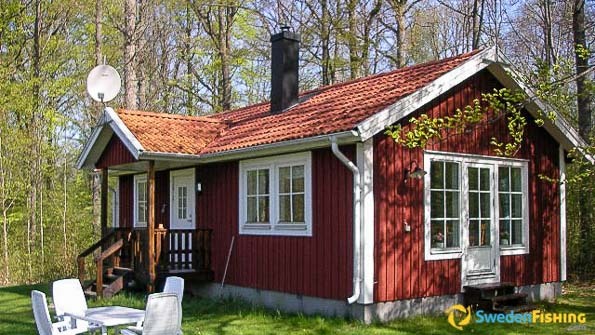 Bosgård has six detached cabins ranging in capacity from two to 14 guests. As they lie near each other you can travel together, but live by yourself. Most of the cabins are around 200 m from the lake and offer a lake view. They are modern and well equipped, fitted with such as wireless Internet, satellite TV, wood stove, dish and laundry machines. There is ample space for boats and canoes at the lake, as well as cleaning tables for the fish. Of the cabins, Björken is worth it price for two, while Almen is a cosy alternative for larger groups. Bosgård is located in southern Sweden about 8 km N of Urshult on Lake Åsnen. Distance to several southern cities is 190 km to Helsingborg, 180 km to Malmö, 210 km to Trelleborg and 85 km to Karlskrona.